classes, then take on the dangerous creatures of Lemuria’s labyrinths with your perfect party! everyone from series newcomers to experienced veterans. preeminent Etrian experience for the series’ final installment on the Nintendo 3DS™. Etrian Odyssey Nexus is a classic dungeon-crawler/mapping simulator that is hard to put down if you’re a fan of turn-based strategy. From exploring vast dungeons to meticulously designing your party, the world of Lemuria is your oyster. If you’re new to the Etrian series such as me, well you picked a great place to start. On top of exploring dungeons and labyrinths, you will also be mapping them out. Now, don’t worry, there is an auto-map feature if you’re lazy that does a really good job of mapping while you explore. In this review, we’ll be going over gameplay features, a little bit of the early story, and all the little ins and outs of the game! As always, minor spoilers ahead. Set out on an adventure where your rewards are fame and fortune! A royal decree from Princess Persephone has prompted the gathering of the realm’s greatest explorers to the floating city of Maginia. Their goal—uncovering the mysteries of the archipelago of Lemuria, home to a great Yggdrasil Tree. Recruit explorers from 19 classes spanning the entire Etrian series, including the brand new “Hero” class, before setting out to Lemuria in search of treasure and glory! 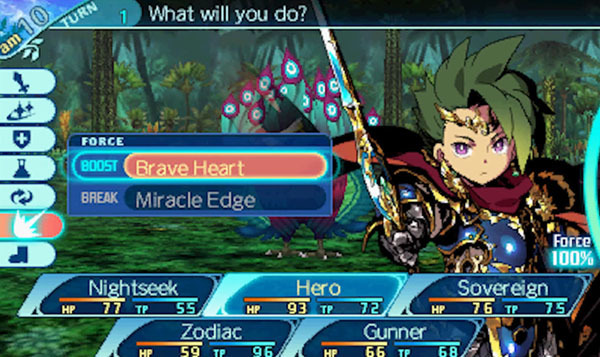 Etrian Odyssey Nexus is a dungeon crawler first and foremost, so the story isn’t the most in-depth experience but takes more of a lighthearted, easy going route. You start off your adventure on the bridge of the flying city of Maginia. You’re introduced to Persephone, which you are then prompted to name your Guild. Your guilds drive and purpose is to explore the lost lands of Lemuria, and she informs you of Yggdrasil, your destination. You are introduced to Mueller the Guildmaster shortly after. Here is where you recruit your guild/party members. After registering your guildmates, Mueller walks you over to Kvasir’s Tavern. Here is where you’ll be dealing with all your smaller side quests, such as fetching this or finding that, etc etc. From Kvasir’s Tavern, you can go to Napier’s Firm, the Shop, or visit the Lady of the Lake, who serves as your inn/save point. This Lady is none other than Vivian, with her furry friend Mr. Merlin perched lazily atop her head. After your urges to protect Vivian subside and you’ve finished introducing yourself to everyone, it’s time to set out. After finishing your first few side/introductory quests, you stumble upon a lost girl looking for her friend at the entrance of your first labyrinth. From here, you explore, map, and eventually conquer each labyrinth, some big, and some small. Throughout your adventures, you meet plenty of colorful characters such as Marco, Oliver, and Wiglaf, who assist you throughout your journey. 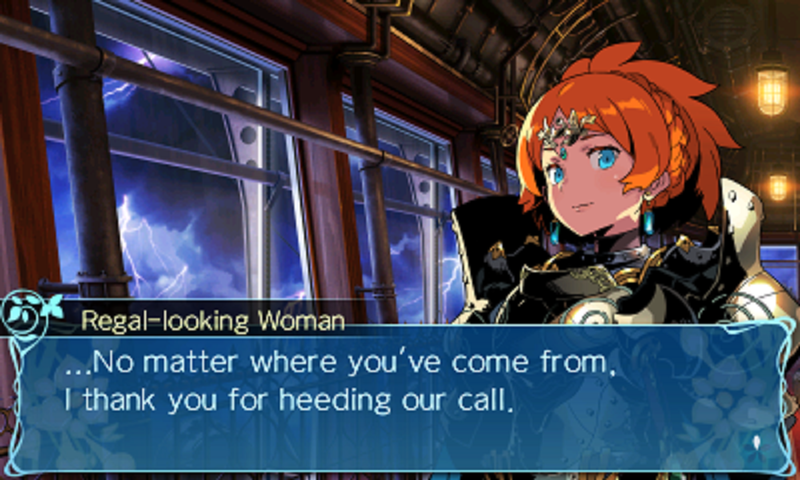 Building your party is one of the most important decisions to make in Etrian Odyssey Nexus. As a newcomer to the franchise, it seemed like a daunting task at first. With a wide variety of 19 different classes, all with their own components, it can be tough to decide what fits your playstyle. After some trial and error, I rounded out my team with a Shogun, Ronin, Ninja, Sovereign, and Arcanist. Like most dungeon crawlers, the core gameplay is exploration -> random encounter -> turn by turn combat -> rewards -> exploration. During combat, each party member has a “force” gauge, when filled, you can activate your “Force Boost” ability, which acts as a powerful class based ability. If you’re really in a pinch during Force Boost, you can use your “Force Break” ability. This acts as an ultimate of sorts but comes at a price. After using your Force Break, your Force gauge becomes unusable until you rest again. This results in being more strategic before deciding to use it! Throughout each labyrinth, you’ll see plenty of different creatures. Some were familiar faces if you’re a fan of the series. Much like monster hunter, you use materials from the creatures you defeat to buy/craft new gear. You also upgrade them throughout your adventures. Some enemies have a chance to be a rare spawn, indicated by some kind of sparkle on the sprite and a different color. Defeating these rare spawns yields more XP, but they have a high chance to flee. As you explore the various areas in the game, you’ll run into plenty of different scripted events. Some may help you out in a time of dire need, while others seeming like the worst luck possible. The game is a long grind, but it does a fantastic job of making that grind enjoyable; something that’s vital to a game of this likeness. On top of the multiple classes available, as you progress and gain experience, you can spend skill points on each characters respective skill trees, each branching off into different builds and specializations. A big part of what makes this game enjoyable for me is the depth of each different class and trying out different team compositions. At its core, Etrian Odyssey’s art style hasn’t changed much from past entries to the series. Nevertheless, I still found myself enveloped by the various labyrinths and a wide variety of creatures you face. Each character sprite is well designed, and you can add your own personal flair to each individual party member. As any other man of culture would, I made my party all cute girls. Creatures come in all shapes and sizes in Etrian Odyssey, from the frightening Berserker King and Cernunnos making a reappearance, to the cute little Ghost Owls and Grasseaters. The ATLUS sound team has always done a fantastic job in my opinion. 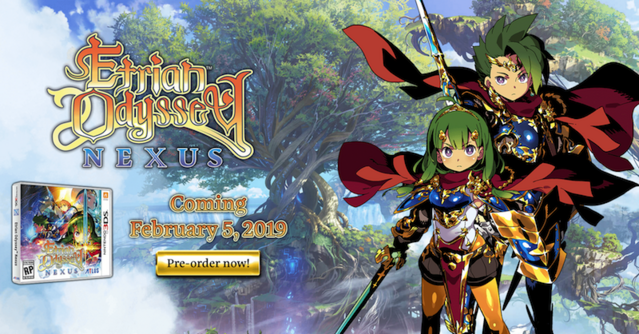 This entry to the Etrian Odyssey franchise is no different. From the auditory cues of each attack to the heart-racing boss music, the game does a great job of keeping you immersed. The music has a wide range of moods to fit every scenario in your Etrian Odyssey experience. It ranges from a grave and ominous, to calm and tranquil tone. Whether you’re exploring a serene orchard, or mere moments away from death, the music clearly relays all that information to you through sound. Coming from games like Persona 5, Catherine, and Bayonetta, the ATLUS team definitely knows what they’re doing over there. Etrian Odyssey is known to for being long games. As a result, beating the game alone will more than likely take over 40 hours. Taking that into consideration, you’re getting 40 hours for $40. This alone makes it definitely worthwhile in terms of how much content is in the game. I give Etrian Odyssey Nexus a very high replay value. This is due to all the different classes making each team composition making the game feel fresh the next time around. If you’re new to the series, don’t worry, the game is very easy to get into the groove of. It also stands out as a remarkable dungeon crawling experience. Whether you are a newcomer to the series or a long outstanding fan, there’s something for everyone here.